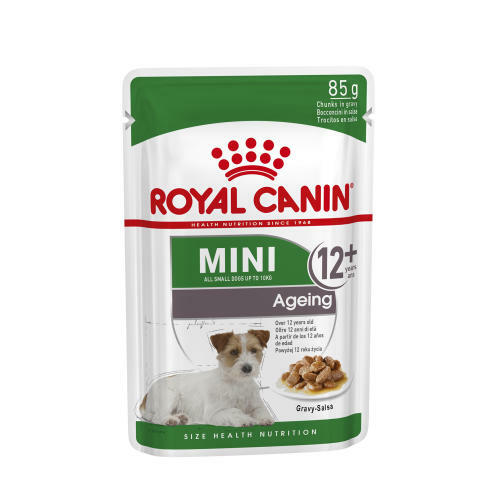 ROYAL CANIN Mini Ageing Wet Dog Food Pouches 12+ in Gravy is sure to keep tails wagging! This is complete wet food for senior small dog breeds (from 1 to 10kg) - over 12 years. Chunks in gravy with adapted phosphorus levels for healthy ageing support and added EPA and DHA. Additives: Vitamin D3:200 IU, E1 (Iron): 6mg, E2 (Iodine): 0.24mg E4 (Copper): 1.9mg, E5 (Manganese): 2mg E6 (Zinc): 20mg. Composition: Meat and animal derivatives, cereals, vegetable protein extracts, oils and fats, derivatives of vegetable origin, minerals, yeasts, vegetables, various sugars. Crude ash: 1.3%. Crude fibre: 1.1%. Crude oil fats: 5.5%. Moisture: 80%. Protein: 8%. Please see image for feeding guideline.